I can feel the addiction building, the powerful intoxicating draw of having a piece of taxidermy on display in my home. 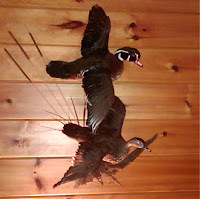 It took the arrival of this recent wood duck piece, for me to finally appreciate the draw of having dead animals mounted all around your home. I just never really fully understood the attraction of having some trophy creature hanging from my wall. Seemingly more like giant dust collectors then artwork and multiplied by the cost and maintenance, the benefits to owning a stuffed critter always seemed to be outweighed by the associated disadvantages. The problem with taxidermy work, that many sportsmen come to soon realize, is that it cannot be entirely appreciated until YOU own it. With ownership, comes the memories of that particular hunt and the other associated feelings that arise every time you look at the taxidermies work. The piece stirs emotions much more powerful than a simple photo, as the work is a complete reproduced representation of a sporting experience. This feeling cannot be “felt” simply by looking at the taxidermy work of others, as it is the direct connection to a once historic hunt that makes a piece valuable to its owner. If you have not yet considered getting an animal mounted start small. There are many small “taxidermy” projects that you yourself can do before you jump in with both feet and blow the entire kids college money on a full African elephant mount . . . more to follow on 6/2. Five deer. Two Hogs. Wood Duck. Bobcat and gator mount coming. It's a disease. I just go my first piece of taxidermy back as well, and I couldn't agree more. 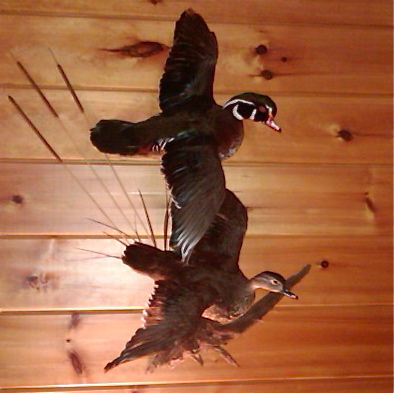 It just so-happens its a Wood Duck mount as well. I have a 30 lb bobcat that I am getting back in February and can't wait!